This trunk is one of our favorites. It makes a great gift for him, not to mention any beer or bourbon lover. 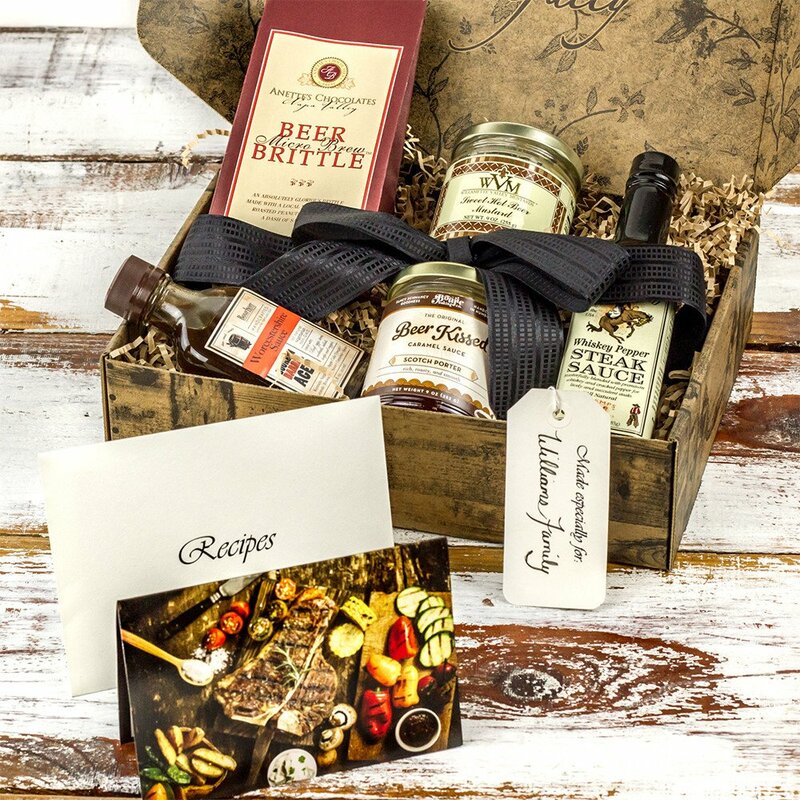 Each item inside uses beer and bourbon to craft a fine work of culinary art. The trunk includes multiple brands pushing the creative envelope with seriously delicious products. Each product comes with chef-inspired recipes printed on easy-to-use cards. Personalize it with a free custom gift card and choose your delivery date. This trunk comes gift packaged and ready to send. No receipt or pricing info is included inside. Scotch Porter Caramel Sauce (Boujie Bakery) – Deep, roasty porter whisked beautifully into a rich, buttery salted caramel. Whiskey Pepper Steak Sauce (Shemps) – The rich, all natural blend of this premium steak sauce adds a hearty flavor to all of your favorite dishes. Old Fashioned Steak Sauce is produced in small batches to preserve the traditions of long ago. Bourbon Worcestershire Sauce (Bourbon Barrel) – This Worcestershire Sauce is a unique take on the traditional all-purpose seasoning. It utilizes the flavors of Kentucky’s Bourbon country. It’s sweetened with sorghum, blended with pure Kentucky limestone spring water, and mellowed in bourbon barrels that were used to age some of the Bluegrass State’s finest Bourbons. Sweet Hot Beer Mustard (Williamette Valley Mustards) – Whether mixing this honey mustard with wine vinegar and walnut oil to make a superb salad dressing, using it as a glaze on pork loin or spreading it on a turkey sandwich, you’ll love what this mustard does to add just that special flavor. Microbrew Beer Brittle (Annette’s Chocolates of Napa Valley) – Beer Brittle? Yes, it’s possibly the best brittle you will ever have tried. This dark Roast brittle is made with Spanish peanuts, Amber Ale and a hint of Salt. The texture is crisp and fresh, leaving a nutty, buttery and hopsy background to cherish.